In this music lover's card deck, the cards bear star's portraits and genres are represented by the suits. Even if musical ability isn't your strong suit, you can play with an all-star band when you're dealt this jazzed-up deck. 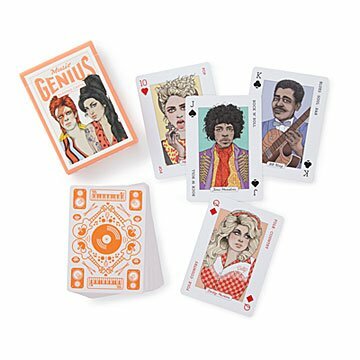 Featuring loving illustrations of musical greats on each card, it splits up the genres into four suits: Hearts = Pop, Spades = Rock, Diamonds = Folk and Country, and Clubs = Soul, Blues, and R&B. Naturally, Beyonce and Prince are royalty (Queen and Jack of Hearts), as are Hank Williams and Bob Dylan (Ace and Jack of Diamonds) and Elvis and Freddie Mercury (King and Queen—duh!—of spades). Uncategorizables David Bowie and Bjork are the jokers. Makes an inspired gift for teens (yes, T-Swift is here) and music lovers who know how to keep their Poker Face (Lady Gaga is too). Designed in London. Made in China. Adorable packaging. Great for a small but unique gift! My mom thanked me and said these were a very thoughtful gift. I originally saw these in another catalogue for almost twice the price I paid with you. Bought 6 decks of cards for many people I knew would enjoy them. Great gift, beautiful art and wonderful quality.